The only sustainable way of achieving more prosperity and higher living standards is to increase the quality and quantity of labor and capital in the economy. This may sound like boring econo-speak, but labor and capital are the two “factors of production” and our ability to consume is limited by what we can produce. That’s one of the reasons why it’s important to reduce the burden of government spending. People sometimes assume it’s important to reduce the budget to lower the threat of tax hikes. That is a good reason to impose fiscal discipline, but it’s presumably even more important to restrain spending because we don’t want labor and capital being misallocated by fiscal policy. Or, as these cartoons illustrate, they’re riding in the wagon rather than pulling the wagon. This is why advocates of economic growth should strive to limit the amount of bureaucrats and how much they’re paid. The bad news is that the public sector is far too large in the United States, and that means (as explained in this video) we have too many over-compensated bureaucrats. The good news, however, is that we’re not Denmark, which has the most expensive bureaucracy of all developed nations. But it’s important to look at what’s happening Europe because BIS, OECD, and IMF data all show that we are going to become a European-style welfare state if nothing is done to reform our poorly designed entitlement programs. 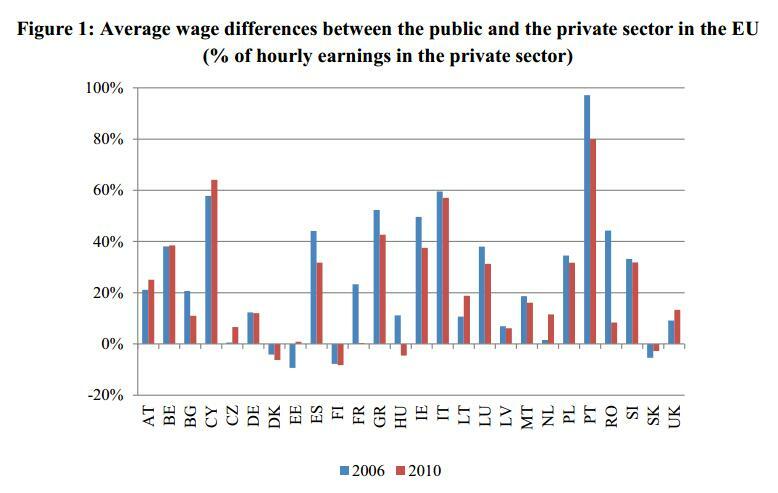 That’s why a new study from the European Commission is worth a look. The report measures both the size of the bureaucracy and the degree to which bureaucrats are over-paid. Here’s a chart from the study that shows the share of the workforce that was diverted to bureaucracy in both 2006 and 2010. 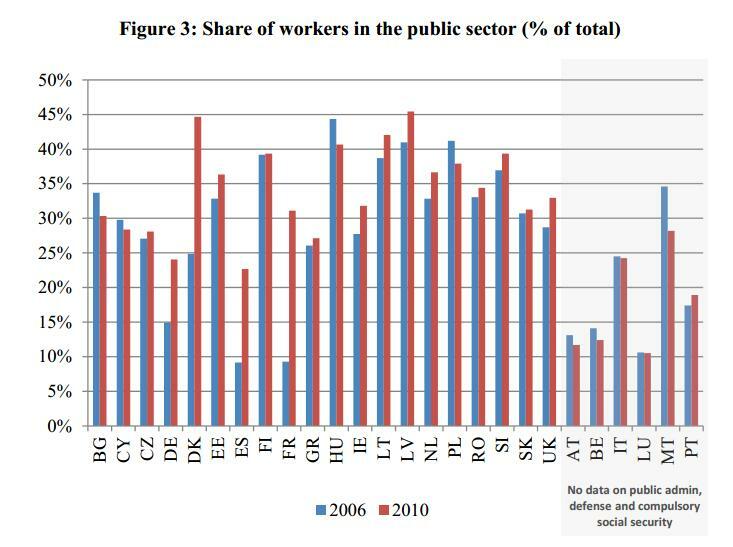 I’m not sure I fully trust the numbers (I doubt, for instance, that France tripled its bureaucracy in just four years), and there’s an absurdly large amount of missing data for nations on the right side of the chart, but we at least can get a rough idea that about one-third of all worker have been sucked into the public sector. That’s certainly not very good news for economic output. And it explains in part why European tax burdens are so excessive. But if you want to be further depressed, here’s another chart from the study showing the degree to which government bureaucrats are over-paid compared to workers with similar skills and experience in the private sector. But there are other nations where bureaucrats are wildly over-compensated. And it’s no surprise that these are some of the nations that are facing fiscal crisis, including Cyprus, Spain, Italy, Greece, and Ireland. And this is why Americans should pay close attention to this issue. 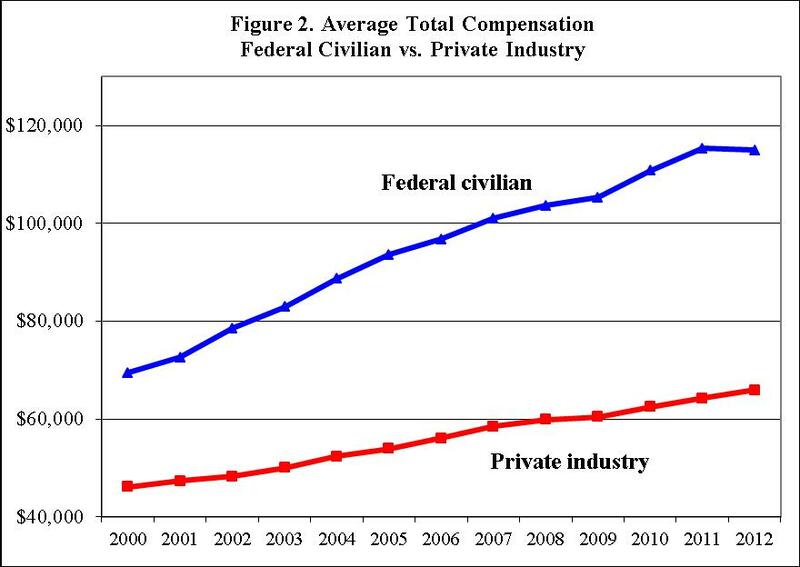 My colleague at the Cato Institute, Chris Edwards, put together this chart showing that federal bureaucrats receive, on average, far more compensation than workers in the productive sector of the economy. These numbers aren’t adjusted for education and experience, so they’re not directly comparable to the second chart in this post, but the data certainly suggest that federal bureaucrats are doing very well and that we could save a lot of money by freezing pay and benefits until the gap begins to narrow. But what worries me is that politicians in Washington will make things worse, not better. Heck, just think of all the new over-paid IRS agents we’ll have to pay for just because of Obamacare! *Some types of government spending, for core “public goods” such as maintenance of rule of law, create conditions that enable private output, so this is not an argument for zero bureaucrats. Instead, the key point is that government should be relatively small and staffed by people who are not being over-paid. **Pay levels are an important indicator, and it’s good that some nations don’t pay bureaucrats more than workers in the productive sector of the economy. But keep in mind that bureaucrats are – by definition – being paid too much if they are part of departments, agencies, and programs that shouldn’t exist. Which reinforces the point about limiting the size of government. P.S. I’ve criticized the European Commission for statism and I’ve mocked the two lead bureaucrats of the EC, but I should acknowledge that the international bureaucracy deserves some credit for producing a report that highlights overpaid government bureaucrats. And it was just a couple of months ago that one of the European Commissioners criticized France for excessive taxation. Maybe, just maybe, reality is forcing Europe’s political elite to wake up. on January 26, 2014 at 9:01 pm Are Government Bureaucrats Corrupt and Dishonest? As long as we have more people voting for a living than we do people working for a living, we will be, at best, a second class country. Unfortunately, I don’t see this changing in the near future, thankfully, I am 70 years old and probably won’t see Mr. Obama’s Socialist America come to full fruition. “The ones who have looted Venezuela are you, bourgeois parasites,” President Maduro said, accusing Daka of raising some prices of products beyond 1,000 percent of cost. “We’re doing this for the good of the nation. Leave nothing on the shelves, nothing in the warehouses!” Maduro said. I can’t believe how they (the president, his team) are taking so much pride in upside-down concepts. It’s scary. Are they even living in this world, or are they living on some isolated island where they have never seen conventional economics at work? It’s not that we will become a welfare state accidentally. Because of our failure to understand what criteria the OECD uses involving social justice in its rankings of what makes a country “internationally competitive,” we can only achieve that status by adopting essentially the OECD’s subjective well-being criteria. So to be internationally competitive under the poorly understood PISA rankings, countries must become social welfare state. And that’s apart from the capability as a human right push that UNESCO is involved in. When it comes to predicting ultimate trajectory, the more important metric is number of voters depending on government funding. Dan, in my book, is one of if not the foremost authority on government spending. Everyone, including conservatives, should consider his writing required reading. The entire debate over government spending is conducted in a sadly superficial and oft-inaccurate narrative. Keep up the good work Dan, and maybe oneday we can change that unfortunate reality.